Sprinkles of inspiration from James Wan and Guillermo del Toro are present in SoCal native Sloan Turner's directorial debut, Consumed. About a girl encountering a supernatural presence around the time her mother arrives home from the hospital to recover from an ailment. Consumed is a very personal story that is strengthened by the girl, Sasha's (Ali Fisher) easy innocence and other-worldly intelligence. Turner was exposed to the horror films her Dad had no qualms about her watching at an early age. Dealing with her mother's multiple surgeries, she acquired a healthy attitude towards the fear of death and the darkness: by confronting it. Her smart homage to Stranger Things as a marketing tool for her work demonstrates an appealing approach at engaging audiences and supporters, as well as showing off her loving fangirl side. 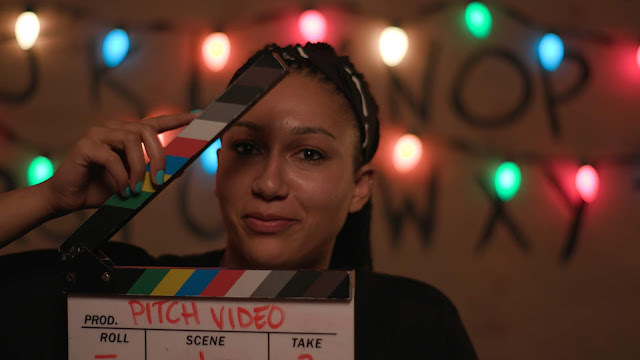 The fresh graduate looks to returning to her home region to "pursue a career writing/directing in the horror genre". As Consumed stands, I'm looking forward to seeing many more diverse, biracial/mixed-race family horror dramas with plenty a monsters to face, battle, and gain victory over. Sloan is a graduate of the University of Mary in North Dakota with a B.S. in Mass Communications and recently acquired a Masters in Film and Media Art from Boston's Emerson College.